Short story... My email went down. Checked my websites hosted on the same server; also down. 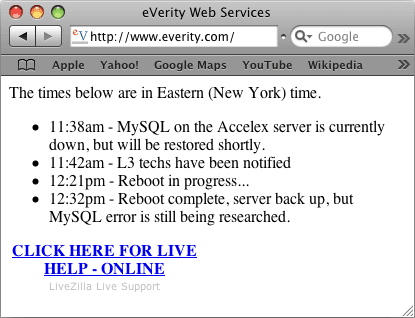 Checked hosting company's homepage; also down (or, only showing a status message as seen to the right). "These problems started when we restored a backup of YOUR site. Hacking is a crime! You need to be getting yourself a new host asap!" At about the same time all my sites started to show an "account suspended"-message. Ehm... Well, I don't remember hacking my own server, and honestly I didn't even know I could hack. I must say this gave me quite a scare, since I thought I might be loosing all my gigs of email I keep on their servers.